It has been recently shown, that certain strains/isolates of Bacillus subtilis can be used as a probiotic for humans. The production of the macrocyclic sactibiotic subtilosin in B. subtilis ATCC 6633 is highly regulated. To improve the subtilosin productivity of B. subtilis, different growth conditions were compared for maximal expression of the sbo promoter that regulates the expression of the subtilosin biosynthetic gene cluster. Oxygen-limiting conditions led to a strong increase of sbo promoter activities compared to aerobic conditions, and accordingly, the subtilosin amount determined by reversed phase HPLC (7.8 mg/L) was 15-fold superior to the amount of aerobic grown cultures (0.5 mg/L). A further promising enhancement of the subtilosin yield was achieved using a deletion mutant that is avoiding the general transition state regulator protein AbrB. The subtilosin titer of 42 mg/L produced by ΔabrB cells grown under oxygen-limiting conditions corresponds to an 84-fold increase compared to the subtilosin titer obtained from B. subtilis wild type cells propagated in aerobic conditions. 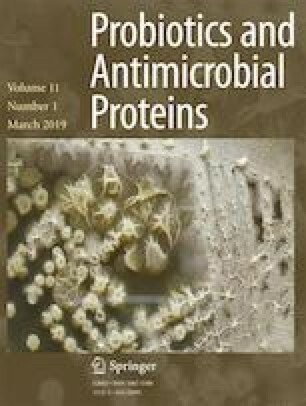 Furthermore, evidence is provided that oxygen-limiting conditions led to a strong decrease in the productivity of the lantipeptide subtilin suggesting contrary regulatory mechanisms for the B. subtilis antimicrobials subtilin and subtilosin. I thank Dr. Karl-Dieter Entian (Univ. Frankfurt) for support.